Understanding and using the limits of our memory. Once, there was a time that the phone company was the most powerful purveyor of information technology and research. The venerable Bell Labs employed thousands of people doing primary research, in exchange for their monopoly status as the only phone carrier. 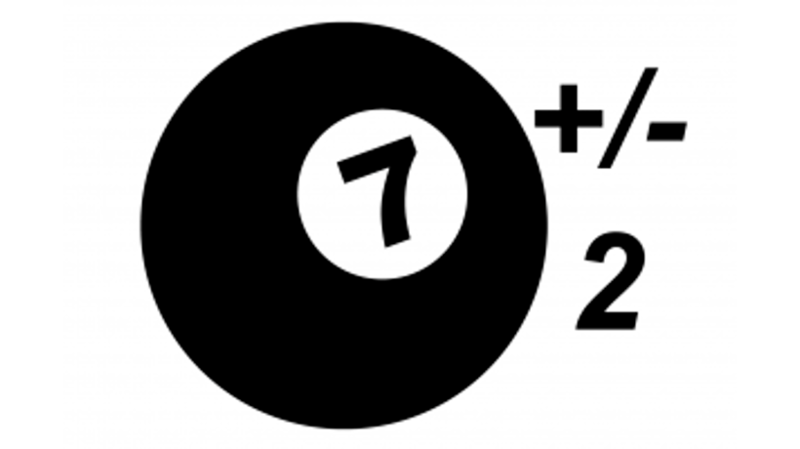 In 1956 (a very good year, by the way), psychologist George Miller published a paper entitled The magical number seven, plus or minus two: Some limits on our capacity for processing information . He had been tasked to empirically find how many random digits a person could remember at any time, so Ma Bell could figure out how many numbers to use for defining the concept of the telephone number. It turned out most people can only remember 5-9 things at any given time without resorting to tricks, such as chunking. This is sometimes referred to as working memory, and its contents are typically lost within 20 seconds without some sort of active rehearsal. This fact alone has significance for people who create presentations, visualizations, instruction, and almost any kind of media. If people can only keep a limited amount of information at any given time, and you want them to follow what you’re showing, you have to manage which of those 7 items should be top of mind at any given time. Sweller viewed long-term memory as "sophisticated structures that permit us to perceive, think, and solve problems", rather than a group of rote-learned factoids. These structures are chunked into things called schemas, which organize a group of individual facts into a single element, taking up one of the precious 7 slots in short-term memory. Richard Mayer’s later work in Multimedia Learning studied the effects of combining various forms of media and their effects on understanding. He proposed that we have 2 primary pathways for sensing information. This is called the Dual-Coding theory, actually an auditory path, which takes information from the ears, and a visual path, which takes information from the eyes. The distinction gets fuzzy when reading is involved. Even though words are initially processed by the eyes, the internal mechanisms of the auditory path are used to make sense of the words. Coupled with the fact that we have a limited number of things we can focus on at any given time, care needs to be taken to keep from overloading a single pathway with too much information. One of the primary goals of information communication of any kind is to present information in a comprehensible manner. Designers must respect the limitations and make use of people’s ability to accept information in order to reach that goal. Miller, G., "The magical number seven, plus or minus two: Some limits on our capacity for processing information"
Sweller, J., "Cognitive load during problem solving: Effects on learning"
Mayer, R., "Cognitive theory of multimedia learning"